I heart the Bind It All!! I took a few practice runs on plain paper just punching holes and lining them up and then I just went for it! So fun!! 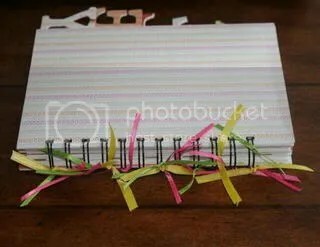 So, this was my first attempt at making a “word book” – one of the hot trends in crafting. I only wish I hadn’t tried to make the letter pages with so many layers of poster board. I had some chipboard, but had heard some people used poster board, so I tried that. It’s too thin for my liking. I kept adding layers to it until I was happy and it took forever. I used my Cricut Expression along with the trial version of Design Studio by Provo Craft to create the files that enabled me to print the ALLEY letters out as a piece of the page. I now have the full version of DS, but at the time I was waiting for it to be delivered. Pretty cool trial version! I created this for one of DD’s friends, for her b’day. It’s basically just a journal/notebook. Blank pages are separated by the letter pages. The back and front of each letter page is decorated differently. So cute!! I used the DCWV Sweet Stack cardstock. Love that stack! This is REALLY nice. It was fun to watch the process of creation as well!